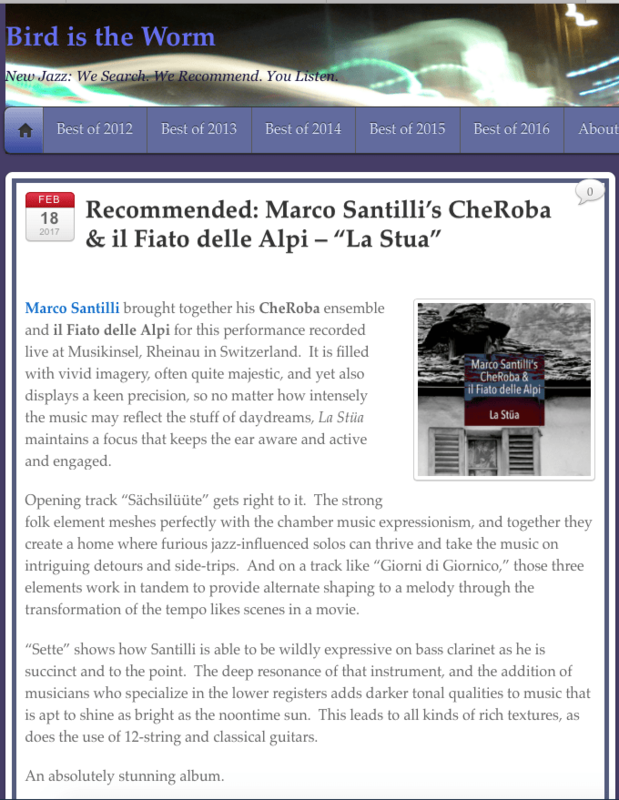 Marco Santilli brought together his CheRoba ensemble and il Fiato delle Alpi for this performance recorded live at Musikinsel, Rheinau in Switzerland. It is filled with vivid imagery, often quite majestic, and yet also displays a keen precision, so no matter how intensely the music may reflect the stuff of daydreams, La Stüa maintains a focus that keeps the ear aware and active and engaged. Opening track “Sächsilüüte” gets right to it. The strong folk element meshes perfectly with the chamber music expressionism, and together they create a home where furious jazz-influenced solos can thrive and take the music on intriguing detours and side-trips. And on a track like “Giorni di Giornico,” those three elements work in tandem to provide alternate shaping to a melody through the transformation of the tempo likes scenes in a movie. “Sette” shows how Santilli is able to be wildly expressive on bass clarinet as he is succinct and to the point. The deep resonance of that instrument, and the addition of musicians who specialize in the lower registers adds darker tonal qualities to music that is apt to shine as bright as the noontime sun. This leads to all kinds of rich textures, as does the use of 12-string and classical guitars. Your album personnel: Marco Santilli (clarinet, bass clarinet), Lorenzo Frizzera (12-string & classical guitars), Ivan Tibolla (piano, accordion), Fulvio Maras (percussion), Isabell Weymann (alto flute, piccolo, flute), Davide Jäger (cor anglais, oboe), Tomas Gallart (French horn), Alessandro Damele (bassoon) and Filipa Nunes (contrabass clarinet, clarinet). Next Post: Good news from Unit Records!